Learn how to accurately mix the right colour for your painted shadows. Some people find mixing for shadows tricky, often trying to mix a whole new colour. Unfortunately the result can end up murky and lifeless and not related to the rest of the painting. But when approached properly, shadows can be packed full of colour and can sit in harmony within their surroundings. It’s a lot easier than you might think. Follow these tips to learn how to paint shadows accurately every time. I start with my tube colour – in this instance Yellow Lake – and then look for its complementary colour, Ultramarine Violet. All shadows have an element of blue, so I choose Ultramarine Blue because it’s warm in tone and leans more towards the violets and reds. We don’t want our yellow shadow to go too green. Always refer to your colour wheel when mixing shadows. 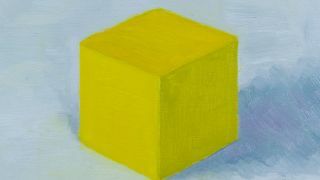 Shadows are made up of local colour (the colour of the object the shadow falls upon – in this study a yellow cube), the local colour’s complementary colour and a blue. If the object is orange, only blue will be added. The object and type of orange will determine which blue to choose. When mixing a shadow it must always be mixed from its local colour. Don’t mix it as a separate colour as it will not be in harmony with the local colour and will stick out like a sore thumb. Don’t just mix these as two unconnected blobs of colour, either. By mixing the local and shadow colours, you’ll create all the gradients in-between. Lighting can differ greatly around an object, so there will be instances where you’ll need to tweak your shadow colours. Here I had a slightly warmer light hitting the top of the cube so after referring back to the colour wheel, I chose to add a little magenta to create a new branch of shadow colour that was pushed further over to the warmer side of the wheel. This article originally appeared in Paint & Draw magazine issue 10. Buy it here.